The shift to digital experience has forever changed the marketing landscape, heightening the need for new expertise, new campaigns, new content and new data-rich repositories for marketers to gain intelligence and insight about their customers. According to a new study from the CMO Council in partnership with IBM, this new business environment has altered content strategies, demanding new forms and formats of engagement, has made the customer journey more complex as brands must manage how and where customers are actively choosing to engage, and has turned customer engagement into a real-time, 24/7 opportunity. However, according to 43 percent of senior marketing respondents, this new era of digital transformation has also revealed cracks in the very systems and processes across the organization…cracks and gaps that make it more difficult than ever to centralize and aggregate data and intelligence across the entire organization. These gaps are doing more than challenging how brands are engaging today—they are putting the future at risk as far too many marketers feel they have yet to master “simple” marketing analytics, making them feel as if gaining business traction through new technologies like cognitive computing is a far off dream. But excitement for these innovations is growing. More than one in four marketers said that they are excited about the possibilities that advancements like cognitive computing hold for the future. So the real challenge will be readying organizations for a future that is here today. 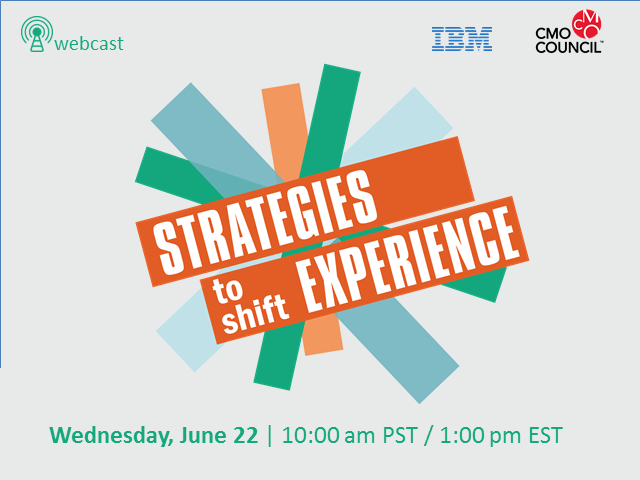 Join the CMO Council and experts from IBM as we delve into the findings of this most recent study and share thoughts and perspectives on how these new shifts and challenges are fundamentally changing where and how marketers must address the holistic customer experience. The interactive roundtable will invite questions and commentary for the live webcast audience, along with active debate and discussion among the expert panel for the webcast.